How was it possible for this much power to be seized by “a right-wing ultranationalist, religio-political revitalization movement”, as it is described in Israel: A Country Study? Gush Emunim was formed in March 1974, a few months after the October 1973 War, known in Israel as the Yom Kippur War and in the Arab world as the Ramadan War. A few months after the war, Gush Emunim was created by the National Religious Party (NRP). When NRP joined the Israeli Labor coalition, Gush Emunim joined with other religious groups and began building illegal Jewish settlements beyond the Green Line. Gush Emunim increased its Jewish settlement activity between 1977 and 1984, encouraged by Prime Minister Menachem Begin’s right-wing government. Since Jimmy Carter left the White House in 1981, succeeding American presidents have uttered increasingly weak protests against settlement expansion, gradually “believing” Israel’s claim that the settlements were not for expansion, but for security . With the rise and departure of each new US president and congress, Gush Emunim grew stronger. How strong has the Gush Emunim movement become? From the scattered Gush Emunim settlements of 1974, the number of settlers now living beyond the Green Line has reached one half million residents, counting those who now live in what Israel considers its annexed areas. The settlement movement has expanded to include large blocs of settler populations, such as the settlement under construction in the picture above, which Israelis call Har Homa. 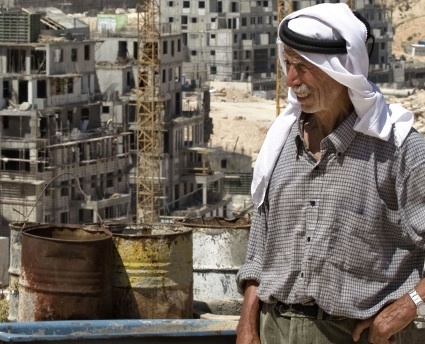 In the picture, Palestinian Said Eid stands next to his house, which is not shown, as construction continues. With its growth in locations throughout the Occupied Territories, the Jewish settler population has emerged as a potent political force. With the rise to power of Prime Minister Benjamin Netanyahu, the settler movement has gained control of not only the government of Israel, but by extension, now influences the US government and US power centers in the US media and the economy. Some of this power is exercised by intimidation and money, and when needed, emotional appeals to such “trip lines” as The Holocaust and allegations of anti-Semitism. The current campaign to agitate for war against Iran, for example, is well documented by Salon author Gary Kamiya, whose posting, The Boys Who Cry “Holocaust”, identifies the “boys” as “the same neocon hawks who lied us into Iraq [and are now] using the ultimate argument-stopper to push war with Iran”. The early Gush Emunim settlers, living in their tents on West Bank hills, may have dreamed of this day, but they could not have imagined that the world’s greater power, the United States of America, would so easily fall into line and follow the dictates of what has become a settler-dominated Israeli government. It was not easy, but it was carefully planned. At a heavy cost of the abandonment of the “shared values” of all religions, the plan was carried out. Decades have passed, but the power of those early settlers and the half million who have followed, have brought us to the 2012 US presidential race, in which, as reported by London’s Daily Mail, Republican presidential candidates vie with one another to promise to go to war against Iran because that is what Israel wants them to say and do. GOP frontrunner Mitt Romney and increasingly popular Newt Gingrich both used a presidential debate on foreign policy to back a pre-emptive military strike against Iran to stop the country obtaining nuclear weapons. Former Massachusetts Governor Romney said that if ‘crippling sanctions’ failed, war would be an option because it is ‘unacceptable’ for Iran to become a nuclear power, while ex-speaker Gingrich argued the United States should covertly ‘take out their scientists,’ and ‘break up their systems’. That is Gush Emunim, right-wing Zionist talk, and it is coming in a Republican presidential nomination debate between a Mormon and a former Southern Baptist, who is now a Catholic. How did this happen? How has Gush Eminum moved from a few radical religio-politco extremists hovering in tents on the hills of Palestine to become a powerful force in American elections? Phillip Weiss, the insightful and wise US Jewish blogger, tackles this issue on a regular basis at his site, Mondoweiss. This week, Weiss posted an entry which he entitled, “NBC and the Israel Lobby”. In this posting, Weiss identifies David Cohen, of Philadelphia, who is, as Weiss puts it, “the longtime political guru of former Pennsylvania Governor Ed Rendell”. David Cohen is also a media mogul, the executive vice president of Comcast, the company that bought NBC and MSNBC in 2009. This makes him the boss of the MSNBC nightly lineup of television talk show hosts that include Chris Matthews, Ed Schultz, Lawrence O’Donnell, and Rachel Maddow. One thing this quartet has in common: They are all PEPs (Progressives Except on Palestine). Cohen’s influence, however, extends far beyond the broadcasters who work for him at MSNBC. Weiss writes that Cohen is also close to Barack Obama. For example, a few months ago, Cohen raised $1.2 million for Obama at his Philadelphia home. Like Ed Rendell, Cohen is pro-Israel. He is the former vice chair of the Jewish Federations in Philadelphia, a pro-Israel organization. Cohen represents the merging of Israeli passionate loyalty, economic reality, media power, and a realization that Israel has the backing of its own creation, the Israel Lobby. Weiss then asks the question that always comes up in these discussions, “what is the Israel lobby?” His answer is one to clip and slip in your pocket to use the next time someone asks you that question. [The Israel Lobby] is the force inside our discourse that defends the special relationship between the U.S. and Israel, forever. Are all Jews part of the Israel lobby? Of course not. There is growing diversity inside the Jewish community, bucking the commandment, Thou must support Israel. Call me cynical, but this proves the old adage, Freedom of the press belongs to he who owns one. And it explains why Chris Matthews keeps his mouth shut on Israel/Palestine. In Israel this week there were reports of the “activities of Israeli settlers who terrorize Palestinians in the West Bank and who have now turned against the Muslim residents of the state of Israel. No American voices of influence in either political or media circles are raised against the power of the Gush Emunim over US and Israeli policies. This is not the case in Israel, where Amos Schocken, owner of Haaretz, a major Jerusalem newspaper, is one of a group of Israeli moderates who know what Zionist ideology is doing to their country. The ideology of Gush Emunim springs from religious, not political motivations. It holds that Israel is for the Jews, and it is not only the Palestinians in the territories who are irrelevant: Israel’s Palestinian citizens are also exposed to discrimination with regard to their civil rights and the revocation of their citizenship. This is a strategy of territorial seizure and apartheid. It ignores judicial aspects of territorial ownership and shuns human rights and the guarantees of equality enshrined in Israel’s Declaration of Independence. Schocken notes that in the situation in South Africa, the term “apartheid” refers to “the undemocratic system of discriminating between the rights of the whites and blacks”. There are two population groups in one region, one of which possesses all the rights and protections, while the other is deprived of rights and is ruled by the first group. This is a flagrantly undemocratic situation. The picture above was taken on June 3, 2009. It is an AP Photo by Sebastian Scheiner. The picture is from Boston.com. Jim, As always you are clear and convincing even it it is so hard to ingest. I struggle to contain my anger and frustration at the seemingly hard wired point of view which seems to have captured the American political governance. Yet we must continue to do the work of telling the story and trust that it will be heard. What a battle we are in. So complex, so fraught with consequences for the world’s people. I pray for our President, that he will sort out all the influences on him and his administration and do the right things. This means pulling US back from support for undemocratic actions by the Right Wing government and its settler backers. Jim, I join Cabby in thanking you for your clear and convincing exposure of what Gush Eminum has done to Israel, but, even more importantly, what we have done to ourselves to fall in line with such undemocratic values. In Israel there are strong and credible voices who are raising the alarm; in this country the major media outlets have generally fallen silent in challenging the notion that Israel is “our only democratic ally in the Middle East”; and no administration believes it can afford (politically) to challenge Israeli policies that violate not only American values but also the religious values that lie at the heart of Christianity and Judaism. I tremble at the comparison, but it bears an uncanny resemblance to “the big lie”. It’s all about money and power, and who is controlling the media. The plain truth, is that Israeli Firsters are in important positions in Congress and in the media, as MSNBC shows. It is forbidden to tell the facts on TV about Israeli apartheid, Jewish supremacy laws in Israel, house demolitions based on religious identity, and other abominations. This is a national disgrace of monumental proportions, that we seem helpless against, except for voices like Phil Weiss and James Wall. Over the past five years Israel has suffered net outward migration of Jews as a result of the far right political situation. Population statistics are a state secret in Israel, but it is estimated that as many as one million have left the country despite programs such as Birthright Israel. one of the major backers of Birthright Israel. Everyone should read “The Wandering Who” by Gilad Atzmon. The book has caused a sensation and has Dershowitz apoplectic and generating the usual lies and slander he employs. I buy Atzmon’s book by the dozen to give to friends. It is a very brave as well as entreating book by an ex-IDF Israeli citizen. Again, Jim, you are to be commended for sharing the awful truth that America’s governing body operates at the behest of AIPAC. The latest effort of the Palestinian people to bring their cause before the United Nations is also commendable. If we knuckle under to AIPAC and go to war against Iran, it surely will be the death of democracy as we have known it in the American context. Question: does the world of nations really want a “flagrantly undemocratic Israel” in its midst backed by the American “military/industrial coimplex? If it turns out that it does, then the western practice of “the rule of law” will surely have been judged, convicted and buried in the anals of history, and we will all be the worse off for it. I am no politician amd no expert, but I have visited Israel, since 1956, and intensely since l982, some fifteen times or more, and have seen, in Israel and what should be Palestine the continual injustice, which has not made its way toi the American press., I am ashamed of my country for its onesided view of all that has happened since the formation of Israel, and I fear for Israel iself as its intransient and undemocratioc treatment of another people, the Palestinians, many of who are very second class Israeli citizens, and many of whom are Christians for two thouseand years are arousing emnity for its poklicies in many parts of the world.. Are we willing to face the truth? Jim, Thanks for highlighting the role of the terrorist organization Gush Emunim in building settlements and facts on the ground in the West Bank, including Arab East Jerusalem. We have a famous saying in the US:”It’s the economy, stupid”. Since the media and politicians in the US do not dare speak out against Israeli occupation, or Israeli nuclear monopoly, and as long as they give Israel Carte Blanc to continue its occupation, and since the attention of Arab leaders has been distracted by artificial scarecrows and windmills, I am afraid that there is only one outcome that will make the world pay attention: Shrinking the collective Western pocket book. The Arab Spring will cast out the second tier of colonial moles, embedded in the first round of leaderships, and the Arab Spring will, sooner or later, reach the entire Arab World. The economic and strategic interests of the West will be overturned and destroyed. Oil prices and resources, alliances, borders, maps, treaties, will collapse and revolutions and guerrilla warfare will turn the region upside down. There will be no winners. All will be losers, for sure. Heavy destruction and disruption of oil resources will be one of the most likely casualties. This impacts enormously the Western Pocketbook and the world’s pocketbook. And all this is in order for the West to support Israeli occupation, apartheid, tyranny, and Medieval savagery. The only way out is for the US and Western Europe to support justice, freedom, democracy, and moral values in the region, including an independent Palestinian State, based on the pre-1967 borders.